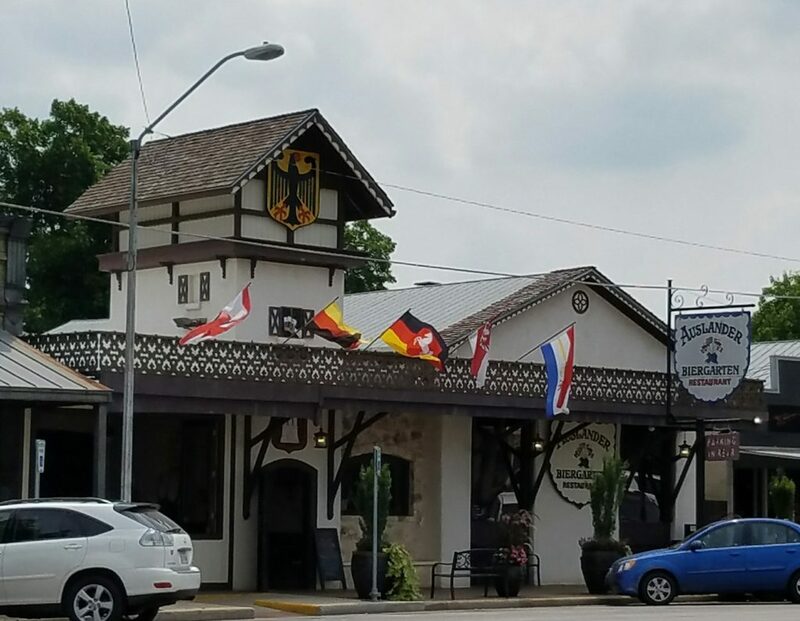 About 30 miles from Kerrville is a, a town founded by German immigrants in the 1840s. 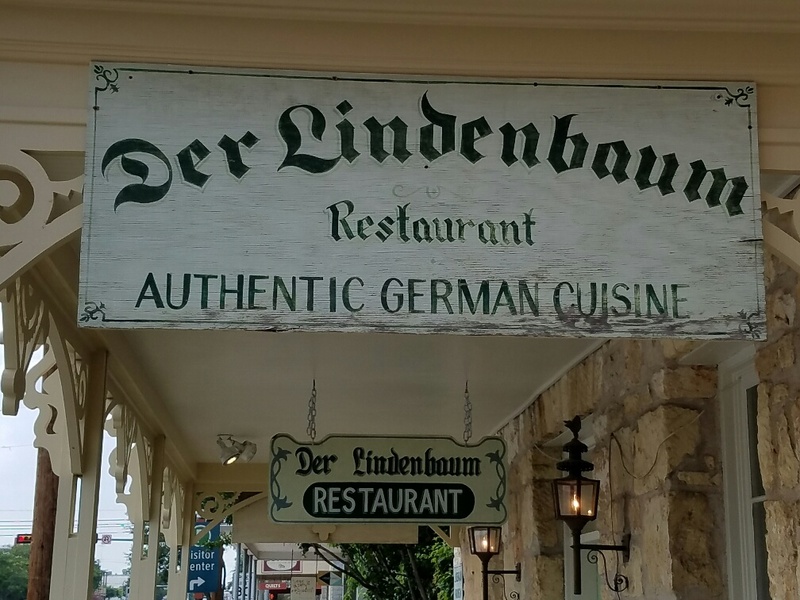 Fredericksburg had maintained a strong German heritage ever since. 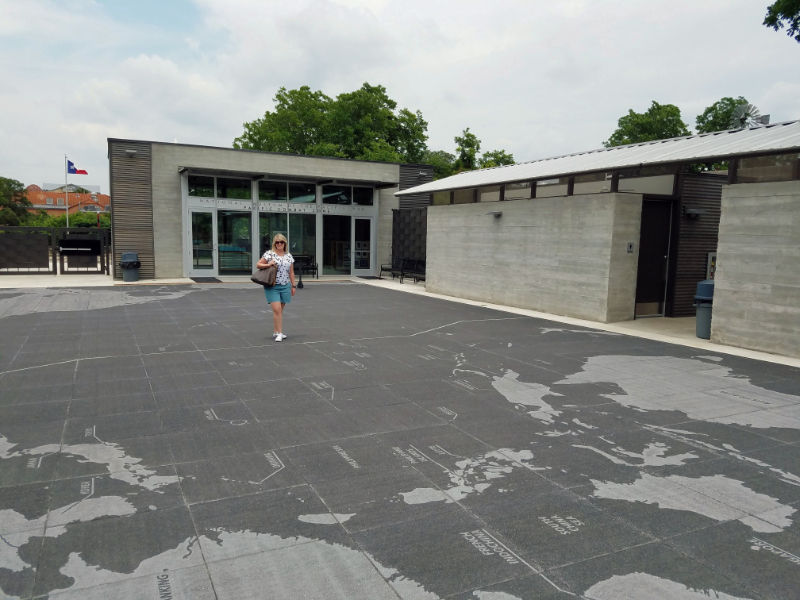 While half the size of Kerrville, Fredericksburg has a much more well developed downtown and main street area, built with great foresight in the 1800s with the sole purpose of depriving tourists a century later of their dollars. Fredericksburg seems to have been bitten by a little of the Austin bug, and as a result is a bit more artsy than Kerrville. There are a number of galleries along the main street along with higher-end clothing stores. 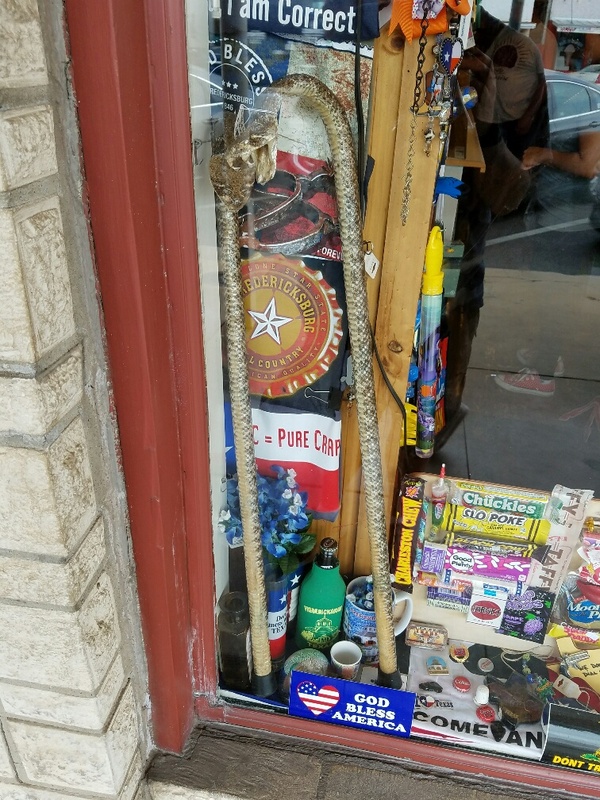 Of course, not all of it is great art – there are plenty of T-Shirt shops and Texicana stores including one that will sell you a stuffed Rattlesnake cane compete with bared fangs. We bought two of them. One for each of us. Not really. That’s just gross on so many levels. Does anyone EVER buy this stuff? So Fredericksburg is definitely a place that caters to tourists. But it does have more than just a tourist Fisherman’s Wharf/Times Square vibe. Remember when I said the Kerrville area looked a lot like NorCal? Well, the resemblance is more than skin deep. Grapes are being grown here and a number of local wineries are popping up. Many of them have tasting rooms on main street. 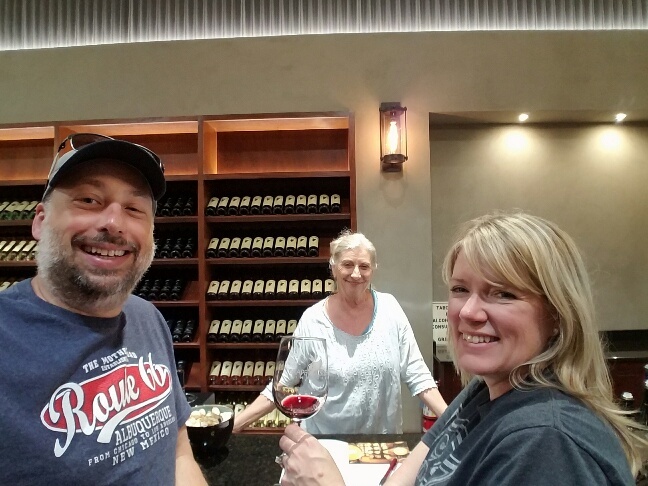 We stopped and sampled the wine. After Arizona, we had a very poor expectation of non-California wines, but after New Mexico we are more open. Where would Texas fall? Turns out, Texas falls closer to California and New Mexico than Arizona. Thankfully!!! Arizona, you got some work to do. We had several very good Merlots and a Super Tuscan that I think would hang with wines costing 2x the price. Style-wise, the wines were higher in alcohol (more like CA and less like NM) and prices were higher (also more like CA and less like NM). Good, drinkable wines were in the mid $20s and their premium wines were scratching $50. That seemed a little high for the quality, but this is the only wine region for hundreds of miles. Still, compared to Arizona wines at the same price these were much better. After wining it up we continued walking down main street. 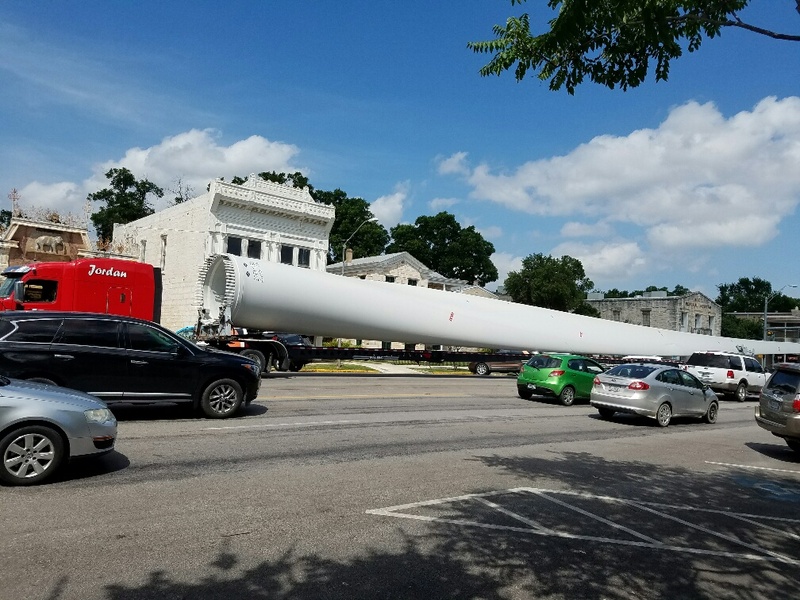 Suddenly we saw a convoy of big rigs that were half a city block long and trailering some long white objects that we first thought were massive pipes. But as the trucks rolled past, we realized they were the blades for wind turbines! Wow. Look at the size of that blade – the tip is off the edge of the photo! That blade must be close to 75′ long. Few people know that Texas is the #1 wind producing state in the USA, and generated nearly 12% of its power from wind last year. Windmills are going up all over the state and Texas has become a leader in profitable wind generation. Farmers and ranchers have embraced the technology, allowing turbines to be built on their lands and sharing in the profits from the power without impacting their grazing or farming. It is great to see Texas quietly embracing the future like this! One of the biggest claims to fame of Fredericksburg is that it the boyhood home of Chester Nimitz, the famous Navy Fleet Admiral served as Commander-in-Chief Pacific in WWII. His grandfather moved from Germany with the initial group of Fredericksburg settlers. He built a hotel in 1852 that young Chester spent his formative years in and around. Nimitz was a natural leader and wanted to have a life beyond the hotel. He tried to get into West Point, but all the appointments from Texas were spoken for. He learned that the Naval Acadamy at Annapolis did have an opening and he jumped at it. He had a distinguished career that eventually led him to leading the US Naval forces in the Pacific in WWII. 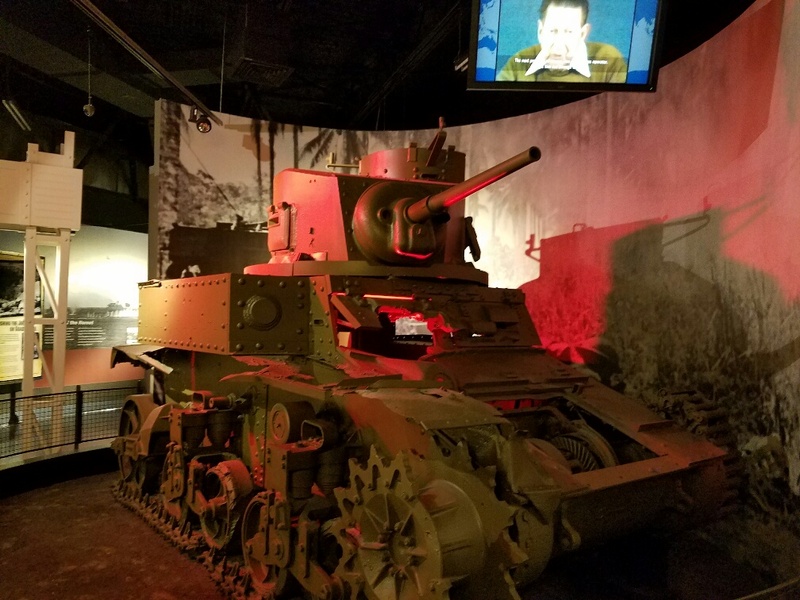 His grandfather’s hotel has been transformed into the National Museum of the Pacific War. The museum has a number of buildings. One of which has this map of the Pacific that shows just how huge the ocean is. Heather is standing in the middle of the ocean, about halfway between the US and the Philippines. Wow. One of the buildings is dedicated to PT boats. The building is so new we could still smell the fresh paint! 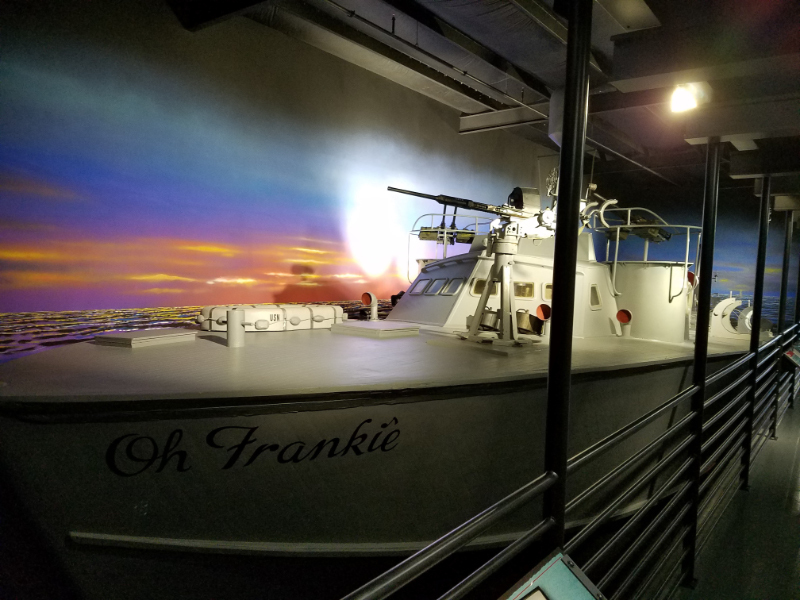 They have a full size PT boat replica inside along with lots of interactive displays. 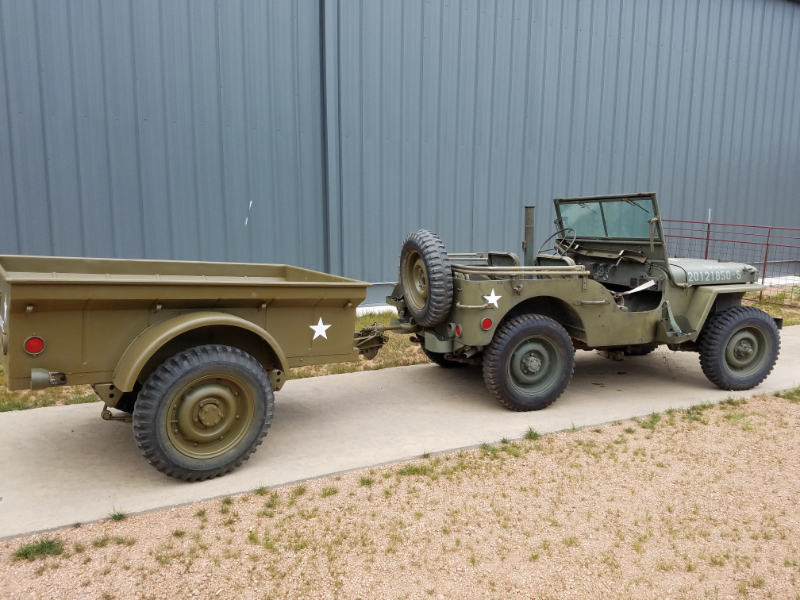 No WWII museum would be complete without a Jeep or two, and they have several on display. 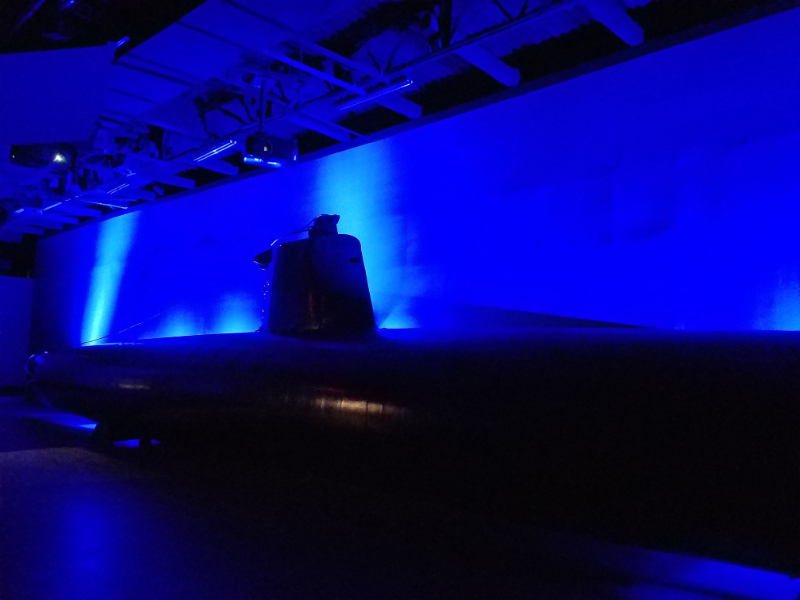 One of the most impressive exhibits is a Japanese mini sub which was captured during the attack on Pearl Harbor. 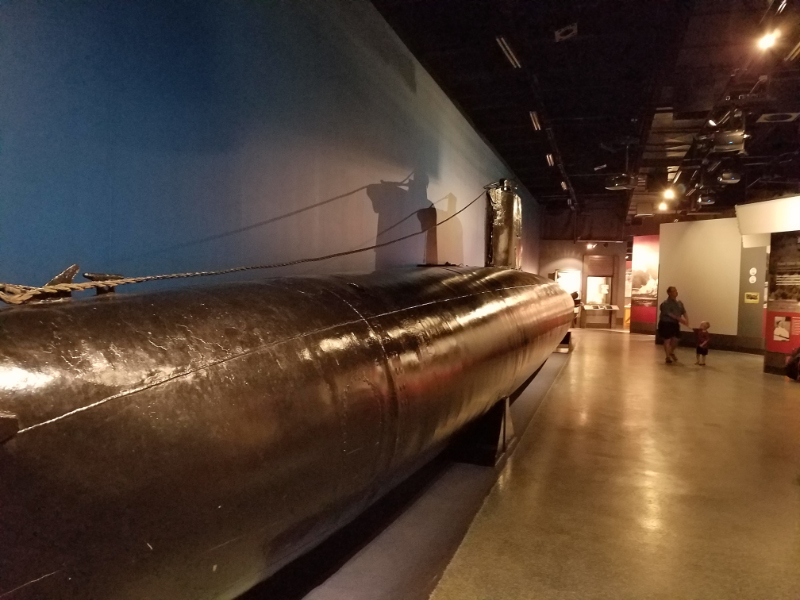 This is the actual sub which accidentally grounded itself due to a navigation error and was captured. To see it still intact after all these years was pretty incredible. There are other artifacts too. The museum has a door from the USS Arizona, one of the battleships sunk during the Pearl Harbor attack. 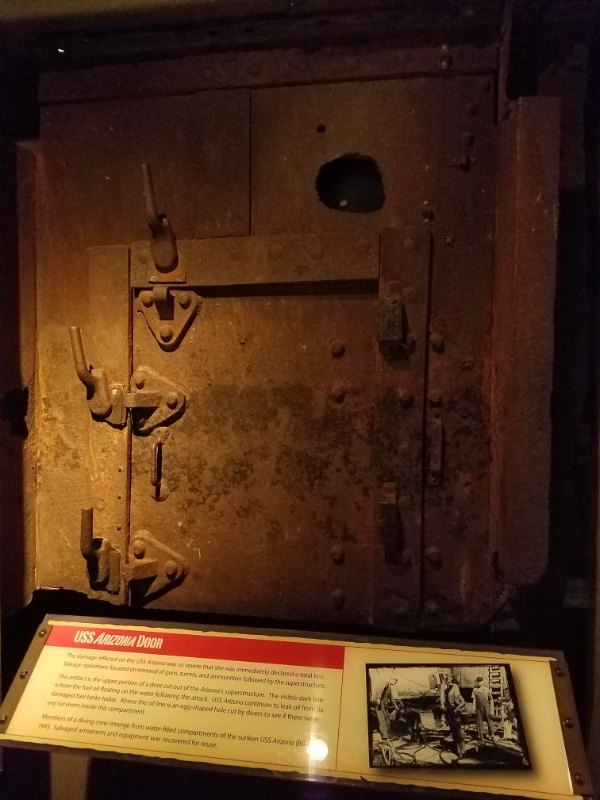 This door was taken from the Arizona and it still has the hole in the upper right where rescuers cut into the door to see if anyone was still alive inside. It was very powerful to see this door. 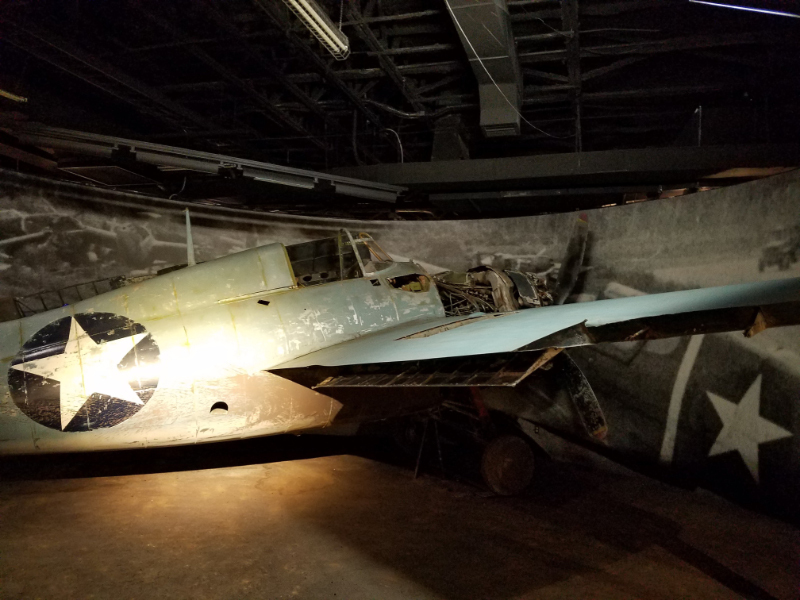 The museum has several aircraft from the Pacific theatre including this fighter plane. They also have a B-27 that was supposedly from Doolittle’s Raiders. I’m not sure if it was one of the Doolittle planes since I thought all of them were lost but nonetheless its really neat to see. This Australian tank was hit by Japanese fire and exploded, killing most of its crew. The Commander survived by crawling out one of the holes blown into the tank. He gave his story in a video interview on the TV above. 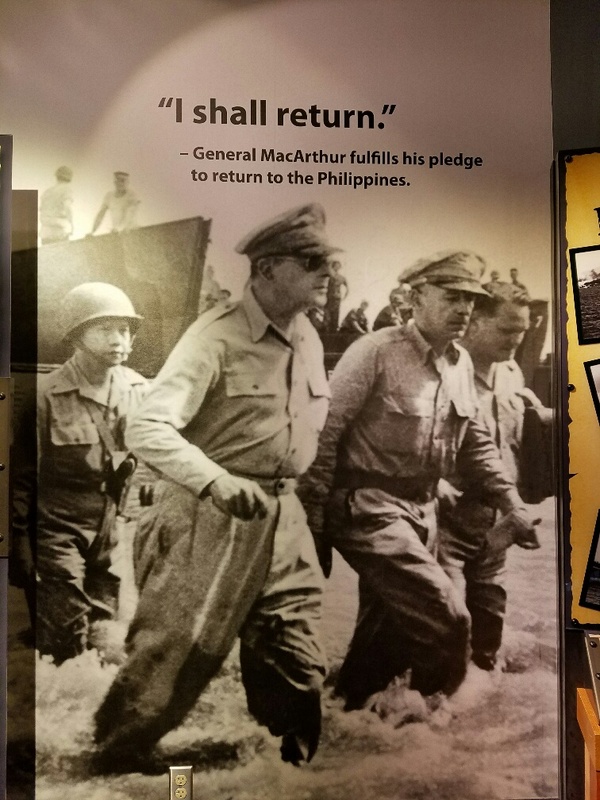 The museum was arranged in chronological order and walking through it was like walking through the Pacific campaign. Most of us think it started with Pearl Harbor, but the Pacific war started long before then. 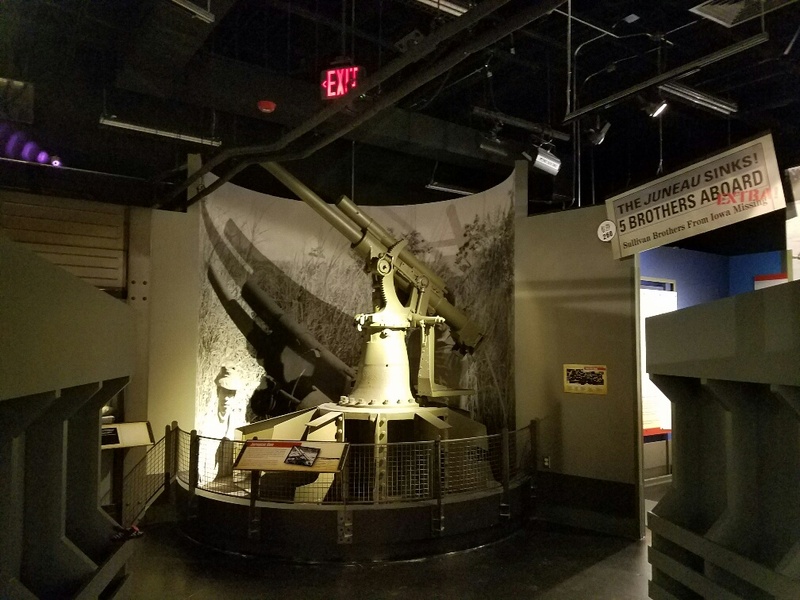 The museum is full of impressive exhibits including this Japanese anti-air gun. I could post a hundred more pictures but suffice it to say the museum is really impressive. Allow at least 3 hours to see it all. The last part of the museum we saw was the peace garden. 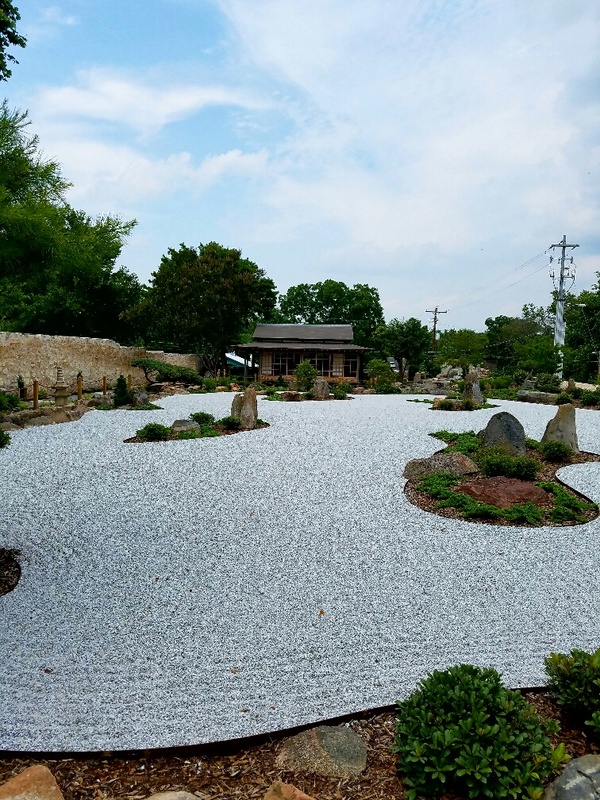 Craftsmen from Japan came to the museum to build the garden. It is a symbol of the post-war friendship between America and Japan. After the museum we decided to try some of the local German cuisine. We went to the Auslander. The place is very Bavarian inside, or at least what I imagine is very Bavarian. 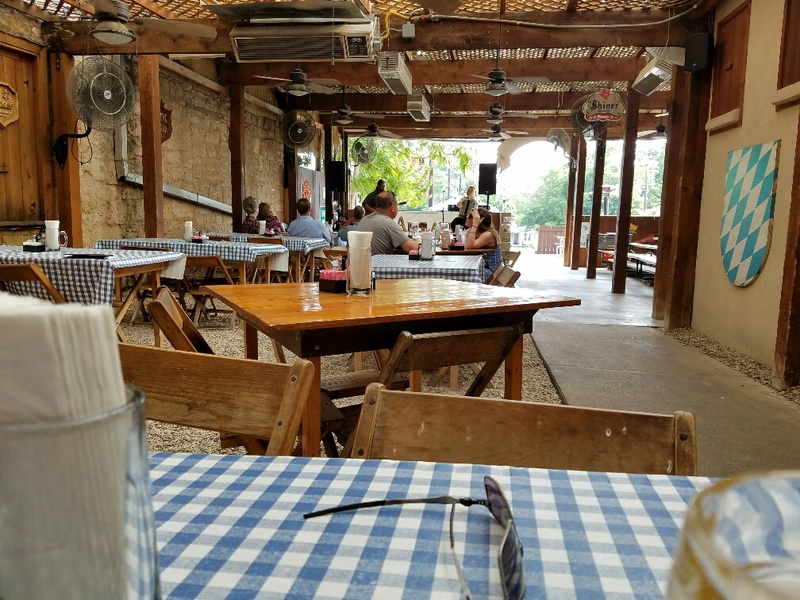 They had live music and we sat in the biergarten. Even more impressive, they had Warsteiner Pilsner! Its hard to get Warsteiner in the US and it was awesome to get it here. 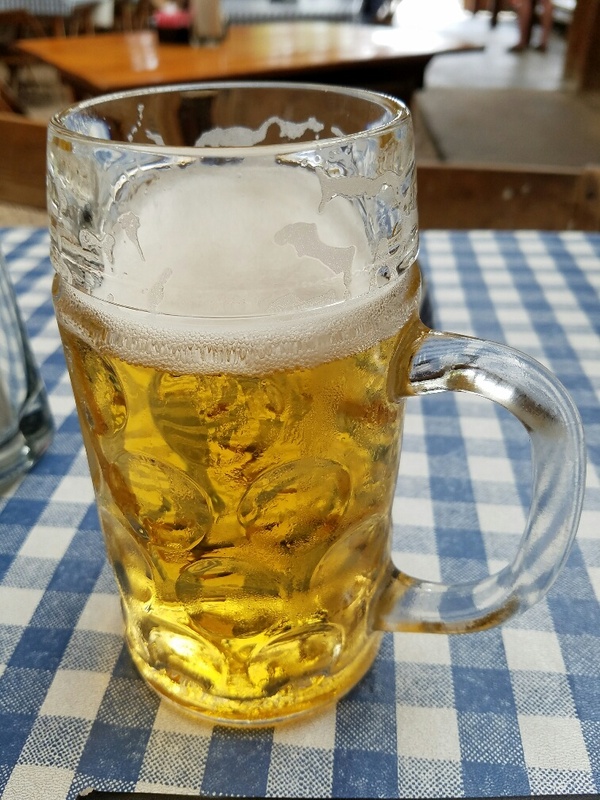 We raised a stein to Fredericksburg and a full day!